One of the many blogs I follow for design inspiration and ideas is House of Turquoise. Back in November, really before I even started plotting and planning for the nursery, a post came up with a nursery, and there was an idea that I knew I wanted to implement. The design is from Elizabeth Sullivan. Those book shelves. I had to have them for the nursery. I absolutely love to read. As a kid, if I wasn't playing some sort of sport, you could find me with my nose in a book. I actually used to even get in trouble for reading...I'd sneak into the closet well after bedtime, turn on the light in there, and get lost in a book. My parents would come in and scold me. I was that kid. So this wall of books has been haunting my nursery visions for quite some time. The bookshelves themselves are actually pretty simple to make. I measured where I wanted them to go on the wall, and came up with 6 bookshelves that were 5 ft long. We got five 10 ft boards of 1x4's, and five 6 ft of 1x2 boards. They didn't have the 1x2's in the 10ft size, otherwise we just would've gotten 2 of those and one 6 ft board. The 1x4's were for the back and the bottom, and the 1x2's were for the front. We started on these a few weeks back during the week. After dinner, we'd go out and put a few more shelves together. And then we pre-drilled screw holes in the back and attached the two 1x4's to each other. Then clamped either end of the 1x2 to the 1x4 to hold the boards into place, and then we nailed the pieces together. Chris thought initially that we were making the shelves too wide, and that the 1x4's should go on top of each other. I told him I was sure Ana had plans for something similar, so we came in to check to see, and sure enough...she does! If you want step by step plans on how to do this with pretty pictures, go see Ana White's post on how-to build it here. And if you want to build anything else, do a search for a plan there. She probably has the how-to's drawn up. She's amazing. Which is why I got to multi-tasking on our floor installation. While Chris was hammering away at the floors, in-between making cuts for the edges for him, I primed and sanded all 6 of these bookshelves. This past weekend, Chris and I split up painting duties. It was such a beautiful weekend that we could both be outside painting. He was priming our next project while I was putting layer upon layer upon layer of beautiful white paint on these bad boys. I'd paint them, sand them down some, and paint them again. I really wanted them to be a bright white and have a smooth finish. I finished up with a coat of minwax's water based polycrylic. It's the only top coat I'll use for white painted furniture. It goes on and dries clear without yellowing the piece like typical polyurethanes do. Finally, these bookshelves were ready for installation! We found the studs in the wall, and screwed directly into those all the way up. We had to be careful to keep these level and mount them exactly the same space apart from the wall. We didn't want any sort of leaning effect going on in here! After we had gotten them all up on the wall, I caulked in the screw holes. I went back the next day and added yet another coat of paint to the backs and fronts of these. My T.Mom had sent over some books for me to use here, and my girlfriend Steph got us a waikiki lullaby book, so we added in what books we had, and I absolutely LOVE the end result! Obviously, she needs more books! And we'll want to mix in the tall and short books, so that the bookshelves are more visually appealing. Like the bottom two rows. I seriously could not be any happier with how this turned out. I love love LOVE it! Chris was really unsure of the project until we put the books on, and he's thrilled too. The top shelf is his shelf. That's the books that Daddy gets to read to her, since he's the only one that can reach it! I'll try to keep more of the soft / touch books on the bottom shelves to start off with. What do you think?! Are you as enamored by it as we are?! This wall seriously makes me so giddy every time I walk into her nursery. I love the way it's all turning out! Happy Wednesday everyone! Hope you guys are having a fantasic week! Update : Want to see the bookshelves fully filled?! Click on this link to check it out! If you enjoyed this post, please leave a comment or subscribe to the feed reader to get future posts delivered to your reader. I'm linking up to the parties in my sidebar! Love, love, love the shelves! They are so cool in the room and I love the way they basically become the wall decoration! She's going to have the cutest room on the block ;-) Love you! Those book shelves are the BOMB! I also love books and think that is a wonderful idea! I love them! What a great idea. You did a great job! love that idea!!! that would be great for a playroom as well!! love the baby's room you are doing an amazing job with your hubby!! ya'll make such a great team!! I love it! Ive been thinking of doing this in our playroom as well. I think the ease of kids seeing the books and being able to put them away is nice as well! I love, love, love these!!! Too bad there won't be any more babies in this house until the grandkids come along. . .but now I know what I'll be doing in that room :) This is really, really neat Kara. All of your hard work is going to pay off in spades. Very cute! I love how they're so accessible! I love it! My kids stay up WAY too late reading too. I want to get something in each of their rooms for better book storage. My 15 year old just stacks them high on her bedside table! I love this idea! I may have to try it out. Oh my gorsh I just LOVE this!!! Cool project! It's never too early to cultivate a love for reading. Oh, I am so jealous! I have been dying over that nursery since I had first seen it. Very cool that you got to make it a reality. Painted ceiling next? I love your book shelves. 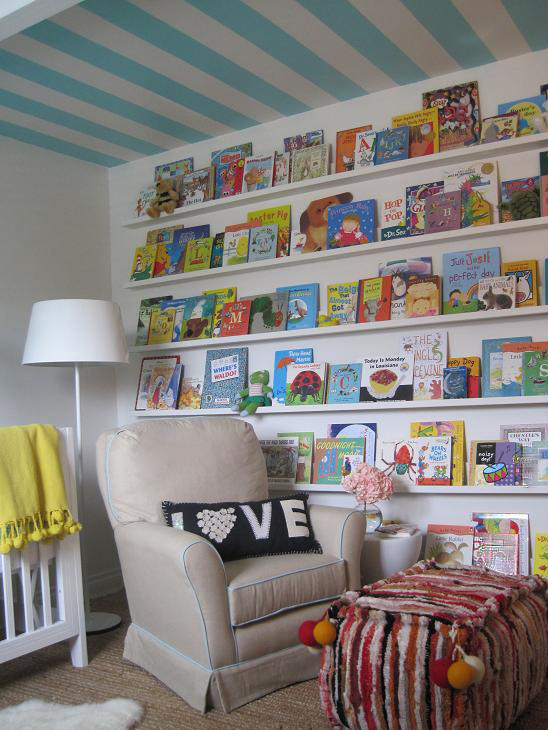 The painted blue stripes on the ceiling are darling! You have such great taste. Love you blog!!! Come by and check out my blog if you'd like. Love the shelves!!!! Definitly going to have to add some of these to my girls' room. Love this! I was also that kid who read with a flashlight under the covers! Can't wait to try it. visiting from shabby chic cottage. LOVE your bookshelves!!! Just showed my husband and he even thought they were awesome...hmm...tomorrow is the beginning of the weekend. it might be time for a project ;o) !!! Wow. I think you did an amazing job. I would love to use one of my kids' walls for a project like this and I know they would love it too. Simply amazing. The nursery is looking great! That's so awesome! I love how the books are such a focal point. How can you not grow up with a love of reading in that room? We have so many books at our house (I too am an avid reader), I wonder if my husband will let me do that in our bedroom? It's great! Thanks for sharing. I LOVE these! We must have been working on ours about the same time. We made almost the same thing at the end of January, and I finally got around to posting about them this week. Yours are longer though. Great job with them. You can see ours at http://helpinglittlehands.blogspot.com/2011/02/easy-front-facing-picture-book-display.html. Also, I'm having Read-Along on my blog for the month of March if you're interested in joining and sharing a book...and you could show off your shelves in your post too. :) Info about the read-along is here http://helpinglittlehands.blogspot.com/2011/02/calling-all-book-lovers.html. Love your blog...Iam your newest follower. I love it!! And it looks really really good! That was my favorite thing about the original nursery too!! My hubby made me shelves like this a couple of years ago and I just love them, they are in the hallway between kids bedrooms and our living room. My hubby wasn't keen on them until I put the books up and then he just said wow! Looks great! We are planning on making the same kind for our little guy thanks for the tutorial it will help making them easier! I saw that same pic and was inspired but haven't gotten around to it. You're so good to go for it. They turned out Beautiful! Saw you on Sugar Bee Craft Edition. I have seen this idea in a free standing book shelf. But, my son has SO MANY books that they were all too small. This is a GREAT idea and would make a huge impact and great on saving space too. This is going in my idea folder and maybe I can achieve this too, soon! Love these shelves. In fact, love how handy you are with tools! I shared this on my blog today. http://holy-craft.blogspot.com/2011/03/things-i-love-this-week.html Hope you stop by! I am seriously in love with these shelves. I think I am going to put some in my hallway. These shelves are great. My daughter would love them for all her books. Thanks for sharing. Hey Kara- awesome job! I'm loving the shelves- they add such a great pop of color to the nursery! They look pretty easy to make, we were considering doing rain gutter shelves but I like these more. SO wonderful! I will insist on this for my first grandchild someday. I am keeping this entry for the future. You are such good parents! These look great! I just built some similar shelves for my postcard collection (http://myellowumbrella.blogspot.com/2010/12/postcard-shelves.html ...not a shameless plug, I promise!). This is super adorable--you guys did a great job! Lol! I used to be *that* kid too, but I'd hide under the blankets with a flashlight! May I just say that you rock for sharing this tutorial. I have been searching in hardware stores for something similar and came to the conclusion that I would have to make it myself. Have a great week, Kara! I love these! We're a while away from having to put a nursery together, but the Wall of Books is definitely something I want when we do! Anyway, I was wondering if you would be willing to come do a special guest post about this for Remodelaholic? Let me know and I will send you the details! The shelves are beautiful. I love the idea of covering the paint with poly. Thanks for the tip on which brand to use. eegad! i love it! i was that girl too...always sneaking off to read a book! OH WOW, I really love this. I showed my husband and he loved it too, we are not very handy but you made it look easy! Thanks! These shelves are genius! I finally know what to do with the empty wall in my dauther's room. I do have 3 questios: 1) What is the distance between each shelf? 2) What size screws did you use to hang the shelves? 3) Did you predrill holes to the back 1x4 or just start screwing directly into the studs? The shelves are 13.5 inches apart (bottom of one shelf to the bottom of the other). I'm honestly not positive one what size screws we used to hang the shelves, just some we had laying around. We did not predrill the holes, we just screwed directly into the studs, and then I covered that with caulk and repainted, and redid a top coat of poly. can you please explain what are studs and how did you put the studs in the wall? Good catch! I had enough scraps for one shelf and forgot to mention that in the supplies post! When you use caulk for projects like this, especially to cover screw holes or to fill in between boards, what kind do you find is the best to use? I just use 35 year quick drying, paintable caulk. They make a ton of different options, and I haven't found one I don't like of the ones I've used. In all honesty, I don't love caulk anyways because I'm such a mess with it, but if I go slow and get a good bead going, and then follow up with my finger for seams to smooth it over, and a putty knife for holes, things turn out looking pretty good. The key for caulk with holes is to be okay with going back to add more in if it's not quite smooth the first time. Hi Kara, absolutely love your work. Can you please tell me how exactly did you attach these to your wall? Also, did you join the 1x2 and 1x4 pieces by using pocket hole method or did you put in the nails/screws some other way. Thanks so much! I located the studs in the wall, had my husband hold the shelf level, and screwed through the shelf into the studs. There's a little bit more on these shelves here : http://mekhart.blogspot.com/2012/04/follow-up-friday-kalias-bookshelves.html . I just use my nail gun and wood glue to join the pieces together. I just filled in the front of the boards with wood filler and sanded down so you couldn't see the holes once they were filled. Like what you saw? Have a question? Got a suggestion? Leave me some comment lovin! Check out Target's Baby Sale! Please click here to vote for my blog! Need to Find Something on the Web? Don't have a blog or gmail, but want to know when I publish a new post? Subscribe via email! I'm a 29 year old wife, brand new Mommy (June 7), mother to a furry son (a yellow lab), daughter, sister, aunt, and friend. I graduated from the University of Florida (GO GATORS! ), where I met my husband, and I'm a HUGE Gator Football Fan. We married in June of 2006. To learn more, see the About Me section on my blog! Nursery Room - Painted Trim! Grab a Button! Code Below! Copyright 2010/2011 Kara Hart. Awesome Inc. theme. Powered by Blogger.